Make-ahead meals are a boon to busy homes. 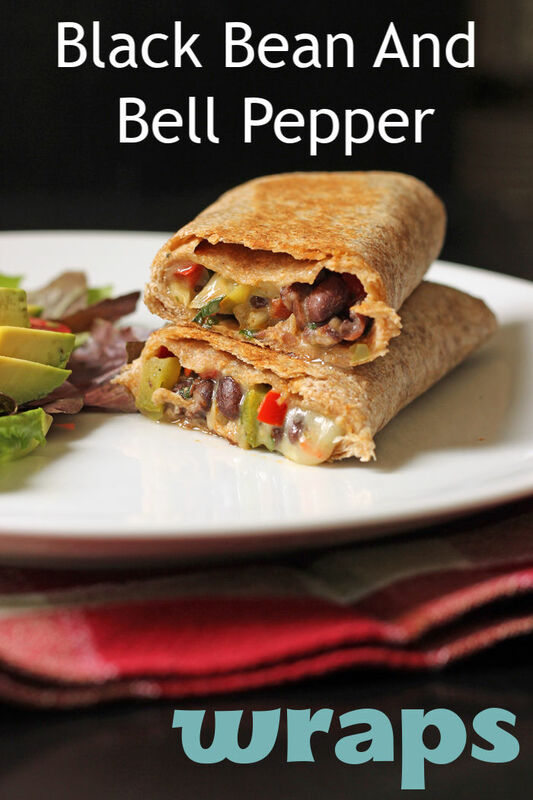 Make up a batch of these Black Bean and Bell Pepper Wraps for a quick and easy dinner. This recipe sounds simple — and it is — but its taste is not commensurate with the amount of work you will put into it. 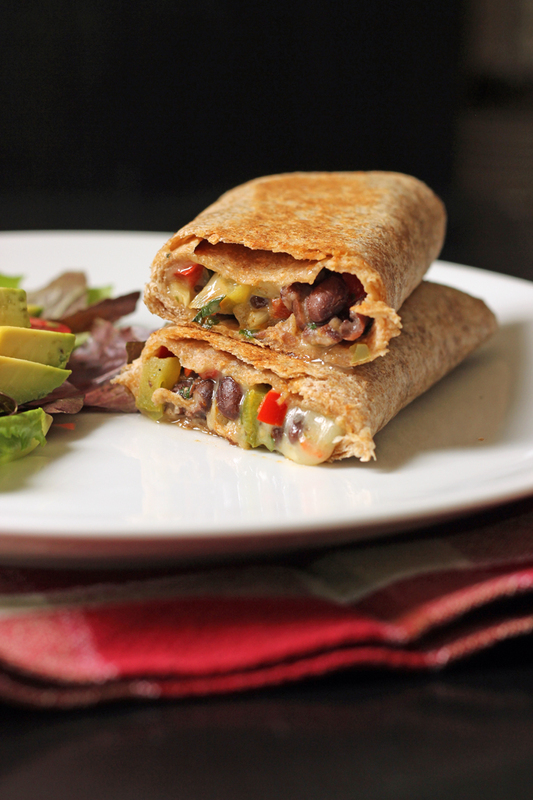 That is to say, these Black Bean and Bell Pepper Wraps will knock your socks off. How could something so easy taste so great? I do not know. But I’m not complaining. I like to make these for quick lunches and snacks, but they’ve served as a regular old dinner on busy nights as well. They freeze and reheat beautifully, making them a perfect freezer meal any day of the year. I love the spicy mixture of pepper jack cheese, tender beans and veggies, and the scent of cumin and cilantro. I suppose you could call them burritos, but wraps sounds more sophisticated. And trust me, these wraps are high class. Are Wraps Healthy To Eat? It really all depends on what you put in them! Wraps are often lower in calories than a sandwich with the same filling. I also used whole wheat tortillas to bump up the healthy factor here. You could also substitute lettuce wraps for the tortillas for a low carb option. 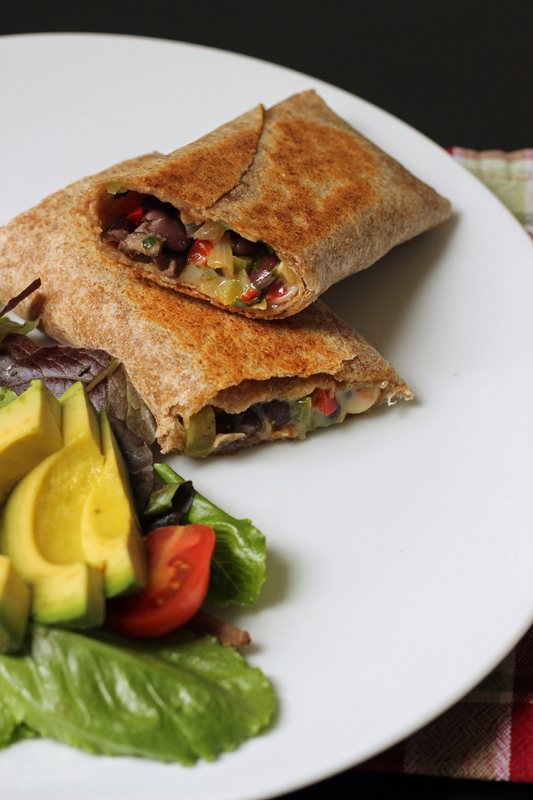 The beans in this wrap are also a great healthy (and budget friendly!) option. Black beans are an underrated legume because they are a great source of fiber, protein, and folate. If you wanted to make these a little lower in calories you could also try omitting the cheese or using a lower fat version. How Do You Roll A Wrap Sandwich? Rolling a wrap sandwich is really no different than if you were rolling a burrito. Have you checked out my burrito rolling video yet? The video will walk you through how to roll your black bean wrap. But basically you want to make sure to keep the filling in the center of the tortilla and keep the sides tucked as you roll. Stock up on ingredients when they are on sale. For instance, when I see a great price on whole wheat tortillas, I buy several packages. The same goes for jack cheese. In some ways jack is a specialty item around here, so I shoot for buying it at less than $3/pound. Do a price comparison. I know that Costco is the best place to buy ingredients like tortillas or bell peppers when there isn’t a great sale elsewhere. I keep track of prices so that I know who has the best deal where. Cook your own beans. While it takes a little more work than opening a can, cooking beans from dried can bring about significant savings. If you don’t want to cook your own just make sure you buy the generic brand. Beans are one of the pantry staples I recommend buying the generic brand. large skillet with lid – I have two of these since I love this model so much. deli wrap – I use deli waxed paper to wrap each burrito if I’m going to be freezing them. In a large skillet over medium high heat, heat the oil until shimmering. Cook the onion until translucent, about 5 minutes. Add the peppers and garlic and cook, stirring, another 5 minutes. Add the black beans, cilantro, and seasonings to taste. Remove from heat and cool, if making the wraps to freeze. 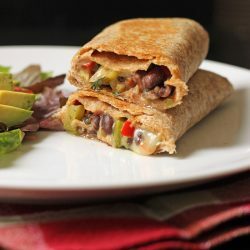 Fill the wraps by spooning a ½ cup of the bean filling down the center of each tortilla and top with 1/4 cup cheese. Roll it up, tucking in the sides as you go. If you’re freezing them, as each wrap is rolled, place it in a freezer bag. If you like, you can wrap each wrap in aluminum foil or plastic wrap before placing it in the freezer bag. If freezing, seal the wraps in the ziptop freezer bags, squeezing out as much air as possible. Store the bags of wraps in the freezer. Thaw them before proceeding with the recipe. Crisp the rolled wraps on a hot griddle or skillet, until the filling is hot and the tortilla is crisp. Serve immediately. Alternatively, you can just heat them in the microwave or 350 degree oven.